In order to bring sustainability back to New York City, I am proposing tapping into its greatest resource: people. By using piezoelectric activated surfaces, energy can be harvested from people walking, driving, and moving throughout the city. Vibrations, impacts, and footfall can be transformed into clean energy to be used to power the City. 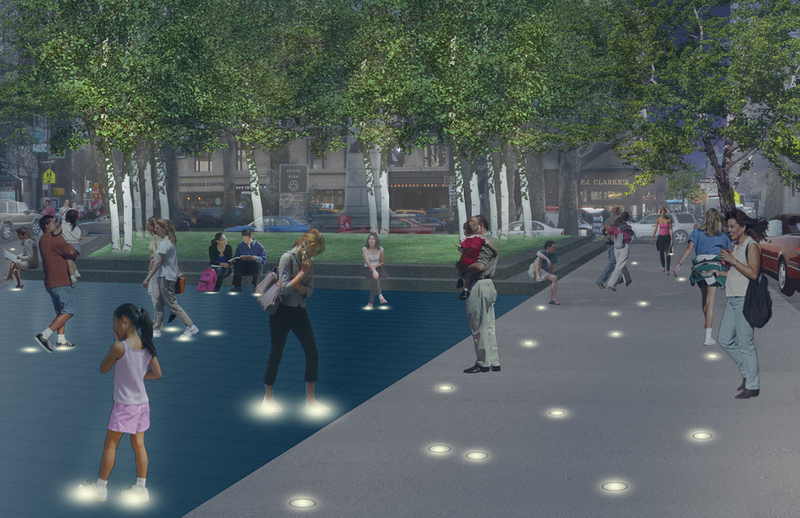 I am proposing that the sidewalks at Lincoln Center and Broadway be fitted with energy activated technology. The energy harvested from this installation will be used to power streetlights, traffic lights, neighboring buildings, site amenities, and energy efficient piezoelectric spatial design solutions. At Lincoln Center, there will be interactive surfaces where people will be able to experience the energy exchange first hand. People will be able to learn, play, dance, perform, and experience the power of people! Advanced interdisciplinary level Landscape Architecture and Architecture studio: within LA, students will be examining issues of urban infrastructure, mobility and modes of transportation, and the relationship of these utilitarian conditions to forming a meaningful public realm within constructed natural and urban landscapes. Within Architecture, students will be exploring structural issues more intensely, as well as the direct relationship of contemporary structures to the urban sites in which these exist. This is a full semester, 16 week studio, with 8 weeks of analysis, including documentation and mapping output, to observe and gather existing contextual, physical and cultural data; this information will lead to arguments relating to urban infrastructure, climate, and pertinent mitigation ideas. The representation of the mapping exercise is intended to be a design quest itself. The second half of the semester will shift to design proposals and push students to conceive of innovative, contemporary solutions and expressions of how to provide public awareness and public space associated with issues of sustainability. We will be analyzing current ‘trends’ of talking’ about and of designing sustainable work, projects, structures, or spaces, and exploring what a new creative, artistic, urban visual and physical language embedded within a sustainable, meaningful agenda might be. Students will be exploring what new forms and their aesthetic within an urban sustainable context might be? The BAC’s site is the area surrounding Lincoln Center Plaza around 64th Street and Broadway. This zone affords several of the infrastructure issues we are observing and intending to solve. The cross sectional analysis, both vertical and horizontal, are of particular interest. The Lincoln Center Plaza area is loaded with urban culture and physical public space, all hinging on the apex of the long Broadway movement corridor. The studio will be conducted by Maria Bellalta, Head, School of Landscape Architecture, and Blas Betancourt, BAC architecture alumnus and practitioner.